The main difference between monocot stem and dicot stem is that monocot stem contains scattered vascular bundles across the stem whereas dicot stem contains vascular bundles arranged in the form of one or two rings. Monocot stem and dicot stem are the two types of stem structures in flowering plants. Furthermore, monocot stem does not contain distinct cortex or stele while dicot stem contains two distinct regions known as cortex and stele. The monocot stem is the stem structure present in monocot plants. The main characteristic feature of the monocot stem is the presence of scattered vascular bundles across the stem. Generally, vascular bundles are composed of xylem and phloem. 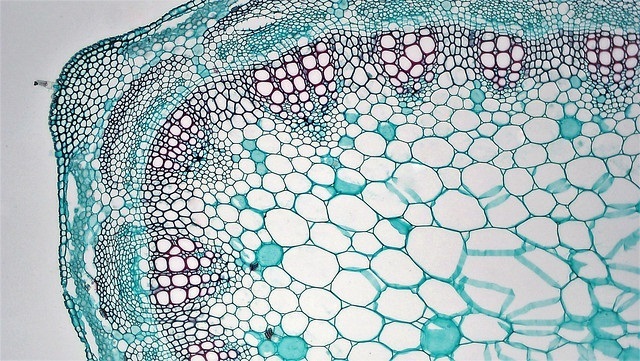 In the monocot stem, each vascular bundle is surrounded by a bundle sheath made up of sclerenchyma cells. Therefore, the vascular bundles in the monocot stem are conjoint, collateral, and closed. Furthermore, the monocot stem bears several significant features including the lack of trichomes (epidermal hairs), medullary rays, cortex or pith, and a stele. Also, the hypodermis of the monocot stem is made up of sclerenchyma cells. Dicot stem is the stem structure characterized by the concentric arrangement of stem structures. The vascular bundles of the stem show a ring-shaped arrangement. Moreover, the vascular bundles of the dicot stem are also made up of conjoining the xylem and phloem tissues. But, these vascular bundles do not contain a bundle sheath surrounding them. Therefore, the vascular bundles of the dicot stem are conjoint, collateral, and open. However, parenchyma cells surround each vascular bundle in the dicot stem. Moreover, dicot stem contains trichomes in the epidermis. Also, the dicot stem comprises a prominent cortex and stele. On the contrary, the hypodermis of the dicot stem is made up of collenchyma. More importantly, the dicot stem undergoes secondary thickening, which leads to the secondary growth of the stem, increasing the width of the stem with time. These are two stem structures in flowering plants. A thick layer of the cuticle is present in both stems. Also, both stems contain single-layered epidermis. Further, they contain a hypodermis. Moreover, both stems contain photosynthetic chlorenchyma cells. And, most of the ground tissue comprises parenchyma cells. Besides, their xylem and phloem are arranged into vascular bundles. These vascular bundles are collateral, surrounded by parenchyma. Their xylem comprises both protoxylem and metaxylem. Functionaaly, the main function of both stems is to hold leaves, facilitating photosynthesis and conduction of water and nutrients throughout the plant body. Monocot stem refers to the stem of the monocot plants characterized by the presence of scattered vascular bundles while dicot stem refers to the stem of the dicot plants characterized by the presence of vascular bundles arranged in rings. Thus, this is the main difference between monocot stem and dicot stem. Monocot stems contain scattered vascular bundles across the stem while dicot stems contain vascular bundles arranged in the form of rings. Another difference between monocot stem and dicot stem is that monocot stems contain numerous vascular bundles while dicot stems contain 4 to 8 vascular bundles. Moreover, the outer vascular bundles are smaller than the inner vascular bundles in monocot stems while all vascular bundles are equal in size in dicot stems. The vascular bundles of the monocot stem do not contain a sclerenchymatous bundle cap while the vascular bundles of the dicot stem contain a sclerenchymatous bundle cap. Hence, this is another difference between monocot stem and dicot stem. Furthermore, the vascular bundles of the monocot stem are surrounded by a sclerenchymatous bundle sheath while the vascular bundles of the dicot stem are not surrounded by a bundle sheath. Also, only two metaxylem elements are present per vascular bundle in the monocot stem while many metaxylem elements are present in the dicot stem. Besides, one other difference between monocot stem and dicot stem is that protoxylem lacuna is present in the monocot stem while protoxylem lacuna is absent in the dicot stem. While the xylem elements of the monocot stem are circular, the xylem elements of the dicot stem are polygonal. The monocot stem does not contain both phloem parenchyma and phloem fibers while the dicot stem contains both phloem parenchyma and phloem fibers. The monocot stem does not contain a pith while the pith is present in the dicot stem. In addition, the monocot stem does not contain medullary rays while medullary rays are present in the dicot stem. Pericycle is absent in the monocot stem while the pericycle is present in the dicot stem. The ground tissue of the monocot stem is not differentiated while the ground tissue of the dicot stem is differentiated into steler and extra-steler tissue. While the hypodermis of the monocot stem is sclerenchymatous, the hypodermis of the dicot stem is chlorenchymatous. Furthermore, the monocot stem does not contain trichomes while the dicot stem contains trichomes. The epidermis of the monocot stem does not undergo silica deposition while the epidermis of the dicot stem undergoes silica deposition. Secondary thickening is another difference between monocot stem and dicot stem. The former does not undergo secondary thickening while the latter undergoes secondary thickening. 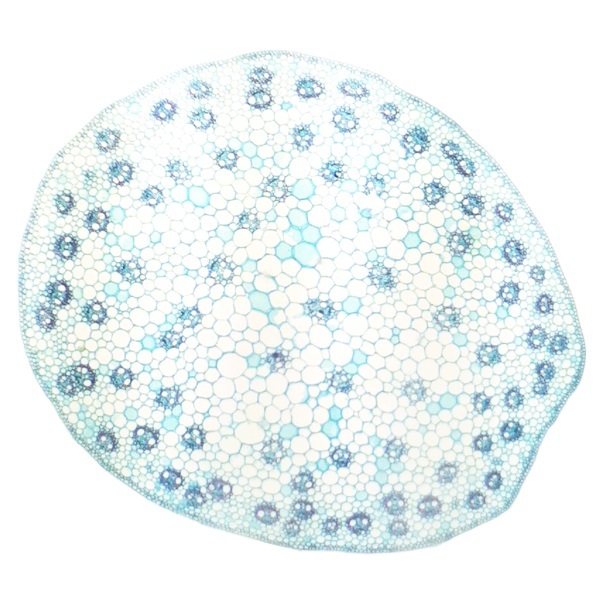 Monocot stem is a stem that has scattered vascular bundles across the stem. Moreover, a bundle sheath surrounds these vascular bundles. Additionally, its hypodermis is made up of sclerenchyma and this stem does not contain a pith or stele. On the other hand, a dicot stem is a stem that has vascular bundles arranged in rings. But, a bundle sheath does not surround these vascular bundles. Its hypodermis contains collenchyma. This stem contains a distinct pith and stele. Therefore, the main difference between monocot stem and dicot stem is the structure and arrangement of vascular bundles, hypodermis, and pith and stele. 1. Farabee, M J. “Monocots and Dicots.” PLANTS AND THEIR STRUCTURE II, 6 June 2007, Available Here.